A fine textured shrub. Blooms very early in the spring with tiny white flowers along thin wispy branches. 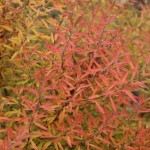 The foliage is bright green in summer, yellow-orange in fall. Prune after flowering to maintain the delicate and fine textured form. It is easily grown in full sun in average, well-drained soils. 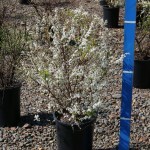 It may be used in foundation plantings, shrub borders or at the margins of woodlands.